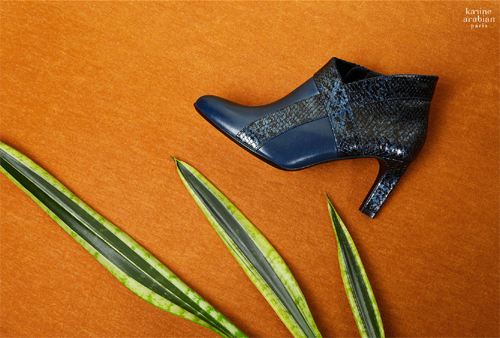 Established in 2000 in the heart of the City of Light, Karine Arabian Paris embodies the traditional French know-how of shoemaking and leather goods design. Creativity, know-how, attention to quality and details are key elements of the brand, as well as attention to contemporary women’s needs and desires. The brand has, since its beginning, distinguished itself as a favorite among women opting for a signature style rather than the latest it-trend. Creative design and modernity, highest quality materials and a meticulous attention to details and colors combinations are the hallmarks of the brand’s identity. Even when a trim or detail playfully recalls another era, Karine Arabian Paris‘ designs always remain contemporary and unique. From the outset, the brand carefully incorporated the idea that the modern woman’s outfit had to increasingly accompany her with elegance and ease from workplace to nightspot. Notwithstanding the uber–glam and ultra-high models that punctuate and titillate every collection, most Karine Arabian Paris shoes do the 24/7 circuit perfectly and are a godsend to women who seek both originality and great-for-all occasion pieces.